Fiberglass jackets await prep work before installation at shipping port. Epoxy-filled fiber-reinforced-polymer (FRP) jackets (forms) are the best type of encapsulation available. 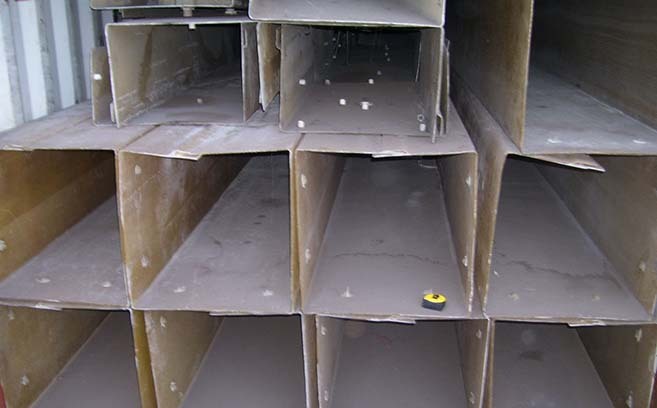 The process of marine pile encapsulation has existed for over a century. Technological advances in materials and equipment have made this process a very effective and economical method of protecting expensive capital investments. In this process, an FRP jacket is installed around a structural member, the jacket is sealed along the bottom edge, and the annular cavity created by the jacket is filled with a two-part epoxy grout, composed of a resin and a hardener to which a fine aggregate, such as silica sand, is added. Rows of “stand-offs” attached to the inner face of the jacket assure a uniform annular space between the structural member and the jacket itself. The epoxy fills any existing voids and effectively bonds to both the structural member and the FRP jacket, creating a monolithic structure. The protection provided by epoxy-filled FRP jackets – both from the effects of corrosion and from physical damage – is extraordinary. Importantly, this technique is often employed on structural members in the tidal zone (splash zone), the extremely corrosive environment at the air/water interface where cathodic protection systems cannot provide continuous protection. Learn more at Epoxy-Filled FRP Jackets.